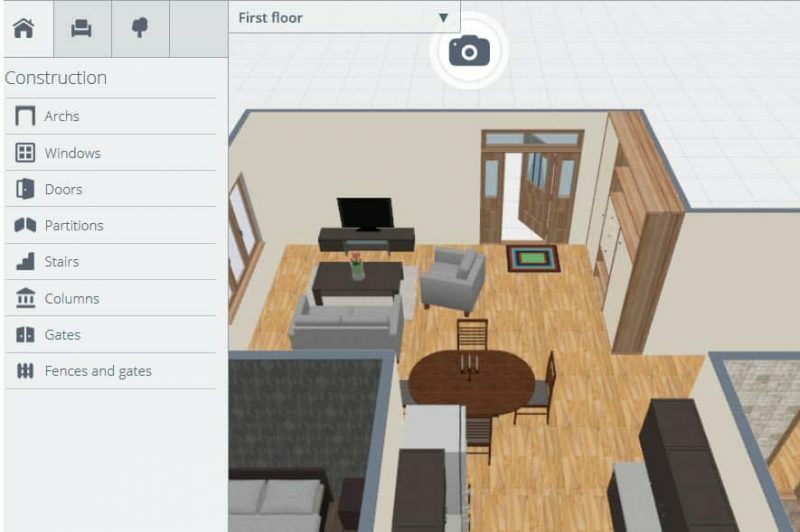 With this free design software you can create and customize your own home projects. You can use the online editor to add a room layout, design your interior, add colors, furniture, lighting, different materials and more. You can even create your layout in 2D or 3D view and when your done, see your creation in a photorealistic view. It’s really fun and easy – give it a try. In the editor you can plan rooms, add materials, furniture, textures, wall art and other decor items. The editor can be used to design in a 2 dimensional or 3 dimensional viewpoint. Using the different modes you can manipulate the height and size of objects to get the perfect look. Rooms and walls can be added and you can change the measurements to get the precise measurements you want for your home layout. Walls can be moved, divided, and connected. The catalog contains over 3000 different items you can add to your layouts through the drag and drop interface. The colors of any materials or objects such as walls, ceiling, and flooring can be changed to suit your style. Using the paint roller feature you can easily change the color of your room to see how different color combinations change the look of your design. You can also add different wood textures, wallpaper, and tile selections to your project.